Nicola LeFanu: Women and Composition: Fifty Years of Progress? Have women composers finally achieved equality of recognition and opportunity? 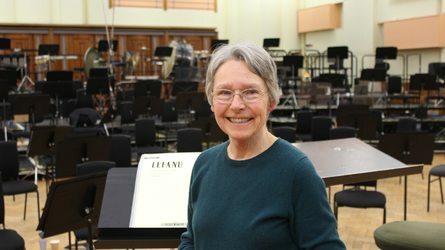 Musicologist Dr Anastasia Belina and composer Nicola LeFanu look across the last half century to see what has changed for women in music, and what still needs to be achieved. Their talks will be followed by a panel discussion alongside Debra King, Director of Brighter Sound, whose Both Sides Now programme showcases women in music across the North; and Philippa Harrison of the Albany Piano Trio who specialise in performance repertoire by women composers. The panel is hosted by Claire Campbell Smith, a choral conductor and former presenter and producer for the BBC. The event will finish at around 9pm; audience members are invited to continue the discussion over an informal drink at the BAT Bar in the Atrium.